SMART was founded on the idea that communities play an important role in supporting children’s education. We support PreK through third-grade children in Oregon to develop the motivation, self-confidence, and reading skills needed to succeed in school and beyond. SMART volunteers in communities across our state contribute their time and talents to help us achieve this goal. Time commitment: 1 hour per week for a full school year (Applications accepted year-round. Volunteers will be placed August - March). Training requirement: 20-minute online orientation and 1-hour on-site orientation. How to apply: Apply online at the bottom of this page! All applicants are required to undergo a national criminal background check. SMART Readers spend an hour each week during the school year reading one-on-one with PreK through third-grade children, modeling and fostering a joy of reading while supporting the child’s efforts to read independently. Our Readers are paired with the same children each week, developing a mentoring relationship with the students they read with over the course of the year. 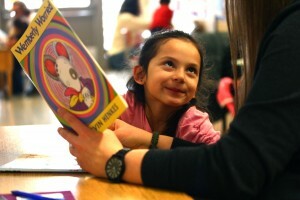 Readers are essential to realizing SMART’s vision of an Oregon where every child can read and is empowered to succeed. To download the full Reader position description, click here. (Opens in a new tab/window). Time commitment: average of 2-8 hours per week depending on the site (mid-September through mid-May). Training requirement: Three 3 hour training sessions starting in mid-September and monthly 1-2 hour team meetings October-May. For late-starting programs, training sessions will take place as needed. How to apply: Apply online at the bottom of this page! All applicants are required to undergo a national criminal background check. Staff will follow up with more information about the role. Site Coordinators are volunteers who take the lead in implementing and overseeing the program at a SMART site with the support of staff and Readers. A program is not able to open until this critical role has been filled. It is because of the leadership and dedication of over 350 Site Coordinators across the state that thousands of Readers and students are able to read together each year. To download the full Site Coordinator position description, click here. (Opens in a new tab/window). SMART Leadership Council Members are individuals across Oregon who help SMART flourish in their local communities through fundraising, friendraising and volunteer recruitment. To see who’s on your local SMART Leadership Council, click here and select your local area. (Opens in a new tab/window). If you are interested in learning more about how to get involved with a SMART Leadership Council, please contact your local SMART office. (Opens in a new tab/window). If you can agree to the three statements below, we would love to have YOU join us as a SMART Volunteer! If you can’t make a weekly commitment, contact your local SMART office to learn more about other opportunities to get involved. Yes, I can provide a positive and culturally affirming environment for a child of any race, ethnicity, family structure, home language, gender identity and expression, or religion. Yes, I can make a commitment to show up each week for the whole school year, with only occasional exceptions. Yes, my goal is to have fun reading with a child, rather than to teach or tutor.